UberEATS works with over 700 of the top restaurants in Johannesburg and Cape Town to offer people food delivered fresh and at Uber speed. Today, UberEATS and KFC jointly announce that customers in Johannesburg can enjoy their favorite KFC meals delivered right to their home or work, for the first time, through the UberEATS app. From 7 June 2017 in Joburg and shortly followed by Cape Town, to be announced, eaters can enjoy those Finger Lickin’ Good moments with family and friends which are brought together by the delicious taste of KFC’s Original Recipe Chicken. UberEATS has partnered with restaurants across Johannesburg with an aim to include more restaurants and expand to Cape Town and additional areas soon. KFC will be showcasing their most favourite items on the UberEATS app, from Streetwise 2 to Twisters, including their famous buckets and other signature meals. To celebrate this partnership, Eaters ordering through the app for the first time can use the promo code KFCEATS, which gives new users 50% off (a value of up to R50 per order) each of their first 2 orders. Orders can be placed between 7am and 10pm. 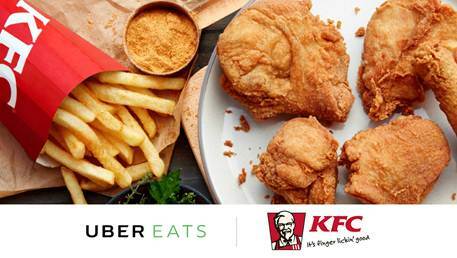 UberEats will start with KFC restaurants in the Johannesburg inner ring (Fourways, Randburg, Sandton and Bryanston) and will expand soon the Cape Town City Bowl. Eaters that don’t see the KFC option straight away should not be alarmed, more stores will be added in the coming weeks. With the touch of a button, eaters can now order their favourite KFC meals without leaving their house or office and get all the convenience, reliability and speed they’ve come to expect from the UberEATS app. Sign in—you can use your existing Uber account for UberEATS. New to Uber? Creating an account is easy. Promo code - first time users can use the promo code, KFCEATS, which gives new users 50% off their first 2 orders (a value of up to R50 per order).